Hillary Chybinski: ahhhh. . .creativity. . . .
ahhhh. . .creativity. . . .
. . .I was so excited today. 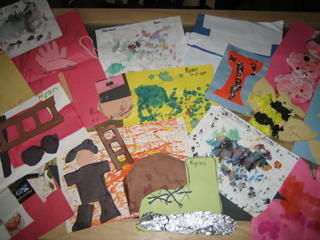 i got all of Ryan's artwork home from preschool today. my favorite is the firefighter picture. . .the snowflake that he cut out (three large white rectangles) and glued to blue paper is a hoot! there was such a great variety, that i spread them all out on the diningroom table and snapped a few pics. now the artwork is all piled up ready to hit the portfolio for the year. looking at chilrens' artwork, reminds me to not be such a perfectionist - that it's really okay, just to do your best, and create something you love. . .that's what i'm hoping this blog will help me do - get a littel less linear and little more creative.